At this stage, the participants of the ISICEM and IFAD meetings were asked the fourth multiple choice question (MCQ4): “Taking into account the new results obtained with the transpulmonary thermodilution and the drop in urine output, what is your treatment of choice at this stage?” Possible answers were: 1) norepinephrine; 2) dobutamine; 3) fluid bolus; 4) diuretics or 5) other. Figure 10 shows the results of three votings. Figure 10. 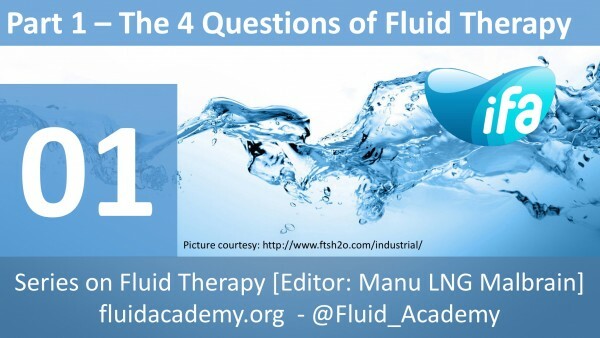 Multiple choice question 4 (MCQ4): “Taking into account the new results obtained with the transpulmonary thermodilution and the drop in urine output, what is your treatment of choice at this stage?”. Distribution of answers (in percentage) on MCQ4, blue squares denote the voting results of the ISICEM 2012 meeting, red squares show the results of the iFAD 2012 meeting, and green squares denote the voting results of the ISICEM 2013 meeting. The majority of participants (49 to 75%) was now in favour of administration of diuretics. Finally, the physicians fully understand the clinical situation of this patient who after the initial ebb phase of shock did not enter the flow phase spontaneously. His PEEP was increased to 18 cmH2O, along with the administration of hypertonic albumin 20%, and he was given an infusion of Lasix® (frusemide, 60mg/hr for 2 hours then followed by 10 mg/hr according to urine output). This treatment was recently referred to as PAL . PAL is one of the therapeutic options that can be used during deresuscitation . By day 3 his cardiorespiratory condition improved with a drop in EVLWI to 15 ml/kg PBW, a PVPI of 1.9 and P/F ratio of 266 (with IPAP 34 and PEEP at 18 cmH2O). Vasopressors and inotropes were titrated to norepinephrine doses of 0.11 ug/kg/min and Dobutamine at 3 ug/kg/min respectively, and he required less albumin 20% and less frusemide. Things continued to fluctuate for the patient over the next few days but with two more episodes of frusemide infusions eventually his EVLWI came down to 8 ml/kg PBW on day eight. The patient was extubated on day 10 and left the ICU after 2 weeks. Figure 11 shows the evolution of volumetric and barometric indicators during the first week (detail of first 2 days is shown in panel B showing opposite effects on volumetric and barometric preload indicators), while Figure 12 shows the daily and cumulative fluid balance. Figure 11. Panel B. Detail during the first 2 days. X-axis shows first 5 measurements (see row 1 to 5 in Table 2). Opposite changes in volumetric (increase) and barometric (decrease) are observed during initial filling. Figure 12. Evolution of daily and cumulative fluid balance during the first week of ICU stay.